Russ is a friendly older gentleman (born in 2008) with a wonderful disposition. He has adoring eyes that can melt your heart. He takes life at an easy-going pace and would love to be in a home where he can be pampered, sleep in a pile of blankets and go on short walks. He loves treats, but his favorite thing in the world is being petted. When it comes to other dogs, he seems to prefer females, especially his friend Kira who he lives with. Russ was originally living in a shelter and came to Best Friends through a rescue organization in New York. His health has already improved greatly, and Best Friends vets and caregivers are working to keep him healthy and happy. 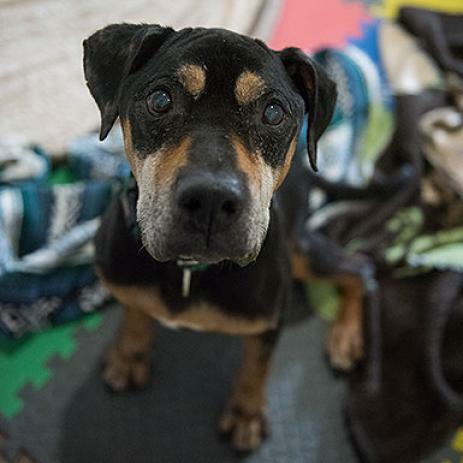 Russ takes prescription medication, and he may experience a weak back end and arthritis. He is looking for a comfortable, quiet home that is easy to get around in and doesn't have too many stairs.